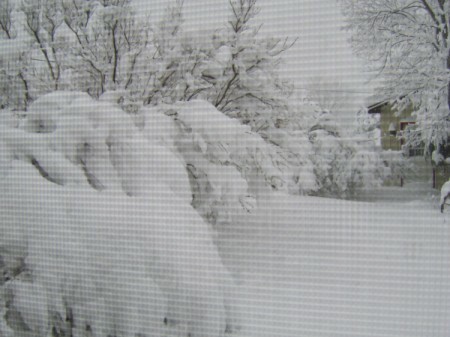 This is the snow storm of March 2013. We ended up with about 18 inches. This is wild, wonderful, WV. This picture was taken out of the dining room window. Way too deep to go out in this much snow. We got about 18 inches of snow. Many people in Virginia and West Virginia lost their electricity. We only went without the phone and internet for 1 1/2 days. I can do without the phone for a day, but not electricity. Spring is just around the corner! Editor's Note: The lines in the photo are from the screen door. I remember those snow storms when I lived there. Retired and now in Fl. What a beautiful picture. The trees look so majestic with their snow blanket! I love Winter.